But instead of vanishing, Ford’s Cleveland Engine Plant #1 is now gaining $200 million in new investment, hundreds of new jobs, and a hot-selling new engine: the 2.0 liter EcoBoost, which powers several Ford vehicles and up until now has been produced exclusively in Valencia, Spain. Rod Deichler (left) and Toddy Riley, working on the fuel efficient Ecoboost engine at Ford’s Cleveland Engine Plant. 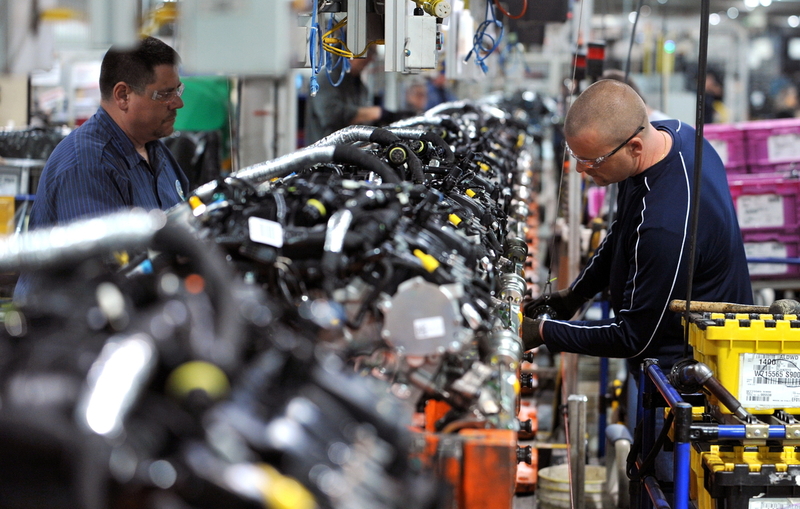 A similar story is unfolding in Indiana, where Chrysler is investing $374 million to build 8 and 9-speed transmissions. Some 1,250 jobs will be added at a Kokomo facility that was nearly closed, and at a second plant in Tipton, Indiana that was built by a supplier firm several years ago but never occupied. Rather than rely on supplier firms, both companies have decided to manufacture core powertrain products required to meet new fuel economy requirements in house‚Äîand in the United States. 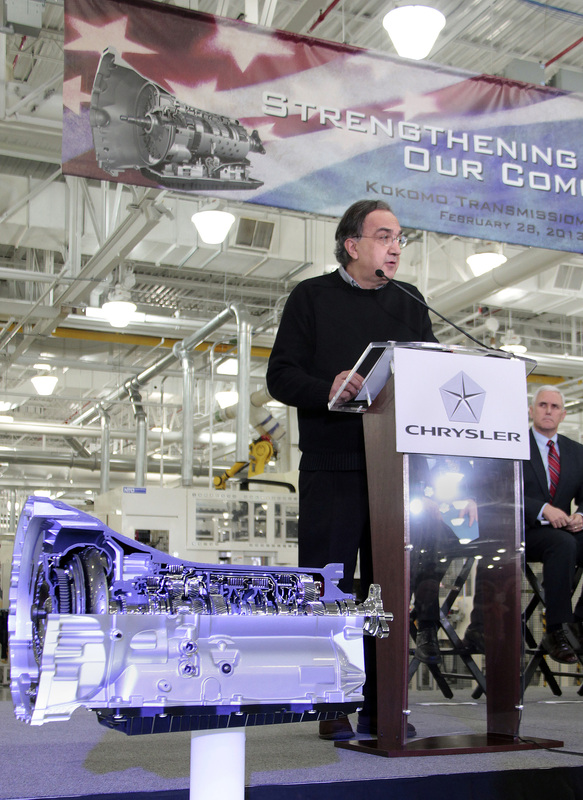 “There was a burning desire within our own house to take as much control as possible over our own destiny,” said Chrysler CEO Sergio Marchionne when the company announced its Indiana investment in February. A comeback in Cleveland: After hitting bottom in 2008, employment at Engine Plant #1 has rebounded to over 1,000 workers, after consolidating with a nearby engine facility. Jobs began coming back as workers were assigned to build the popular 3.5 and 3.7 liter EcoBoost engines, a fuel-saving option on Ford’s best-selling F150 pick-up truck. Forty-two percent of Ford F-150 customers now select the EcoBoost engine; the company is selling more of them per month than it expected to sell in a year. With Ford’s February announcement that it will to add production of a 2.0 liter, 4-cylinder engine to the Ohio facility, the company expects to add 450 workers over the next two years to staff a two-shift operation. And plant manager Charlie Binger told the Cleveland Plain Dealer there’s a “great possibility” of adding a third shift, depending on product demand, which would result in several hundred additional hires. The 2.0 liter EcoBoost is used in 2013 models of the Ford Edge, Escape, Explorer, Focus ST, Fusion and Taurus. Using direct fuel injection and turbo-charging to improve fuel efficiency, the engine delivers highway fuel economy gains ranging from 14 percent on the Focus ST to 47 percent on the Ford Explorer. Shifting production for the North American market from its current location in Spain, company officials say, will lower shipping costs and give Ford more flexibility to supply dealers in the U.S., Canada and Mexico. Chrysler CEO Sergio Marchionne, announcing new investments at the Kokomo Transmission Plant. Insourcing to Indiana: With new investments in Kokomo and Tipton, Chrysler expects to grow its northern Indiana workforce to over 7,350 workers ‚Äì a 20% increase from current headcount of 6,100. When completed, the two plants will comprise the largest transmission installation in the world, say Chrysler officials. Transmissions with eight or nine speeds ‚Äì an increase from the five or six speeds found in most of today’s vehicles ‚Äì cause engines to operate more frequently in their optimal speed ranges, yielding higher fuel economy. Chrysler has already installed eight-speed transmission in the Jeep Grand Cherokee, the Chrysler 300 and the Dodge Charger.